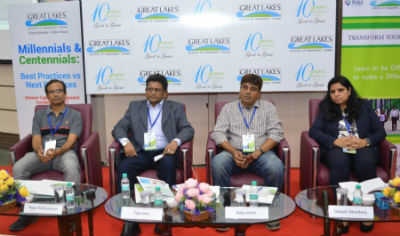 Chennai: Great Lakes Institute of Management hosted its 10th Annual Human Capital Management Conference (HCMC) on the theme “Millennials and Centennials: Best Practices vs Next Practices” at its campus. Chief Guests Dr. V Damodaran, CEO & MD, Ameex Technologies Inc., and Mr. Sandeep Dhar, Chief Operations Officer – Business Services, Capgemini inaugurated the event in the presence of Dr. Bala V Balachandran, Founder, Dean & Chairman, Great Lakes Institute of Management, Mr. Shreenath, Group Director & Chief Corporate Relations, Great Lakes Institute of Management, faculty members, staff and students. The conference, centred towards its theme, aimed to build a platform between future MBA graduates and leaders, present from various corporates, and discussed on strategies to counter the changing workplace scenario. Chief Guest of the event, Dr V Damodaran, CEO & MD, Ameex Technologies Inc, said, “ I have to admit – the theme of the conference is complex, demanding and relatively new. Why? 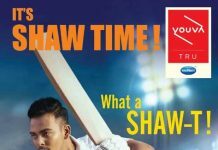 Because it is very much relevant to the current generation – Gen X and Gen Y, as they are digitally erudite, marching towards automation, in need of challenges and want to set up clear goals in their career. The inaugural session was followed by Panel Discussions on topics – Role of Evolving Management in Redefining Corporate Culture and Perception – The Performance Influencer. The first panel consisted of 4 panellists – Mr. Tojo Jose, Chief Human Resources Officer, Muthoot Pappachan Corporation, Mr. Babu Vittal, Head HR, Shop Clues, Ms. Deepali Bhardwaj, Executive Director – HR, Cushman & Wakefield, Mr. Rajan Sethuraman, Chief People Officer, Latent View Analytics. In this session, the panellists deliberated on the role of management in crafting and strategizing millennial experience in the work sphere that will align both individual and organization s interest in achieving common goal. The second panel consisted of 5 panellists: Mr. Andheri Prakash Babu, Head HR (India), IMI Critical Engineering – India, Mr. Krishna Gopal, Global Head – Leadership Hiring (Sales & Support) and Talent Management (Sales), Tech Mahindra, Mr. Naresh Rajendran, Head – HR Operations & Strategic Projects, Vestas India, Ms. Minakshi Arora, Director Strategy & BPT, Trident Group India and Ms. Ayshwarya Srinivsan, Vice President – Human Resources, India Campus Recruitment Head, Barclays. In this session, the panellists highlighted on how corporates are adopting strategies, and focussing on an individual’s perception, and not performance. Mr. Shreenath concluded the annual conference by saying that such conferences provide students a comprehensive corporate vision, and an opportunity to listen and interact with eminent exponents from the corporate world, which is a true privilege to the student community.